Join the other major hospitals and laboratories and take your healthcare to the next level by looking to your other line of business applications to interface with an enterprise content management (ECM) software. It typically is going to be a Health Level 7 (HL7) file. By doing so, all the information (requisitions, EOB’s, claims) that are coming to you can be automatically indexed and used by a quality ECM software to perform rules-based routing of documents for workflow. Reduction in Errors (no more manual data entry) ensures record completeness. 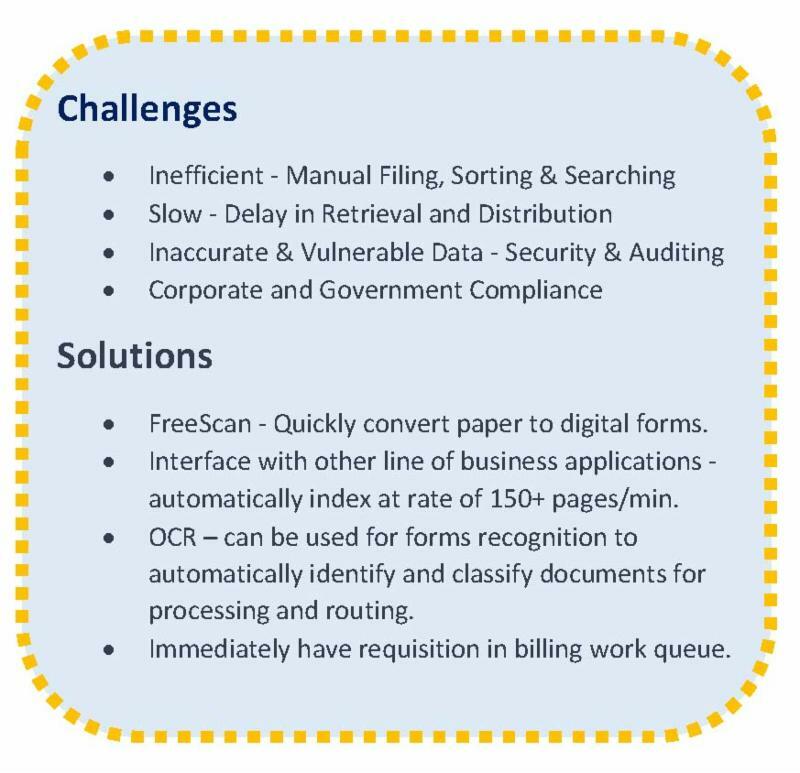 Increased Efficiency – requisitions, EOBs move seamlessly. Expedites Billing Process – claims can be processed quicker. No more Lost Requisitions – lost paper requisitions can be regenerated from electronic orders. Revenue Increases – No more lost requisitions that are written off to bad debt. To learn more about how your healthcare system or laboratory can benefit from ECM visit website or watch a demo. While at the ANI 2016 in Las Vegas we attended a special session intended to help exhibitors in their onsite experience. Additionally, they held a panel discussion that included CFO’s and VP’s from various health care systems. For most people in the marketing and sales world this is a welcome opportunity. To hear first-hand what issues healthcare executives are focused on right now as well as what message resonates with the C-suite and decision makers is all good stuff. Each year we participate in the ANI 2016 HFMA event and each year is a unique experience. Held at the Sands Expo Center in Las Vegas proved to be a classy venue. With more than fifty breakout sessions to choose from there seemed to be something for everyone. This year’s theme was “out of the box” thinking. Keynote speaker/presenter Eric Topol, MD was clearly a fan favorite this year. I heard numerous attendees raving about his talk. A cardiologist and author of The Patient Will See You Now: The Future of Medicine is in Your Hands spoke about the future of medicine and the challenges that come with it. He spoke about the lack of a need for a stethoscope when physicians now have access to portable ultrasound devices — among many other things. (To read more about this debate click here…). And to learn more about Topol’s work and book click here. RICAR provides a comprehensive and secure environment for all your documents within educational institutions: Admissions, Business Offices, Student Records, Career Services, Donors and Alumni Relations (to name a few). As an administrator or member of the IT team are you looking to improve the way you collect, manage and store data? As a school district administrator or member of the IT team are you looking to improve the way you collect, manage and store data? Teachers need access to curriculum, administrators need access to departmental records (student records past and present, HR, accounting) so they can track student and school progress and improve efficiency. The next reasonable step for education is determining a document management solution. Determining the right software for your institution can save your staff and administrators valuable time and money in saved labor hours. Typical return on investment is within the first six months. Document and Enterprise Management Small Business Solutions Start Here! We’re your one-stop solution if you’re looking to improve your workflow needs. If you have boxes of documents in storage on-site or off-site that you would love to have available electronically and accessible…quickly…well we can help you with that. If you have critical high security content that you want to make sure is not only secure but accurate – we’re talking auditing here – well… you can count on us for that. If you’re looking for an out-of-the-box solution for your document management needs that is easy to launch, easy to learn and easy to maintain, well look no further! Are you afraid to go paperless? 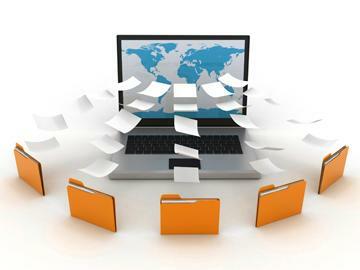 The arrival of content and document management software has changed the lives of many – improving the efficiency of both capturing and retrieving documents. While the technology has been around for some time (more than 20 years), many industries (and surprisingly large organizations) remain paper based not solely due to cost – as you might imagine – but quite possibly out of fear. There’s a certain comfort level in seeing and knowing that a paper document is, what appears to be, safe and secure in that file cabinet or storage warehouse. Unfortunately, the truth of the matter is –those documents and their data are more at risk of being lost, stolen or destroyed in fire, flood, etc. As documents are captured and classified during the indexing stage, RICAR’s Auto Form Notification can be tracking missing forms for management. For example, if the teachers in your school or clinicians in your health care facility are required to complete a form showing they’ve renewed their state licensing by May 1st then a manager can run a report showing missing State Licensing Form. Can Big Data provide answers to ECM? Big Data is the latest BIG thing. So what’s all the buzz about? Big data analyzed across functional silos can provide information for analysis. Thus providing you and your organization the means to improve efficiency, processes and more. RICAR FreeReports can provide your organization the data to analyze productivity, document access and statistical activity. 1. Author. Find out if the company authors the document management products they’re providing…A supplier that wrote the software is much more able to customize the product to fit your needs and more likely to update the software, keeping you more competitive. 2. One-stop Shopping. Ask if the supplier provides a complete document management system or do they use third-party organizations to fill the gap. A one-stop solution usually means a more seamless install and only one supplier needed for support. What is it and more importantly, why do I need it? In the 1980s a number of vendors began developing software to manage paper documents and then later developers began to write programs that managed electronic documents – files created and/or stored on a computer. In 1995, Freedom Imaging Systems’ programmer created the first version of RICAR for a Michigan based laboratory. RICAR (Record Image Capture And Retrieval) is a document management software – which went one step further than earlier creations in that it focused on the electronic: collect, capture, store, index and retrieval of documents. Are you concerned about your source documents? Are you confident that the crucial information coming from patients, physicians, laboratories, providers and payers are being accurately entered into your EMR, EHR or other information or billing systems? With an ever changing healthcare arena, there is increasing motivation for accurate data – from the patient, the providers you send your patients to as well as the payers. It’s good for everyone involved, especially your healthcare practice. But all manual data entry processes, understandably, are error prone. And those inadvertent mistakes can be costly to both the patient (with regard to care and satisfaction) and the provider (with regard to expense and reimbursement). Think for a moment of how many times you, or one of your staff, have found (or thought you found) data entry errors within an electronic record? And at those times, were you easily able to go back to the source document and confirm that the data within the patient’s record or information/laboratory/billing system was accurate? If you were not easily able to (or could not) confirm the data was erroneous, you’re missing out on an industry standard quality assurance solution. Every time one of your staff accesses and reviews a record, there is an opportunity to ensure the quality of the information contained within your records. Your highly trained knowledge workers can typically spot an inaccuracy ‘a mile away’! Is Your Patient Payment Information at Risk? If you are accepting credit cards for payment then the next question is, “Are you PCI Compliant?” PCI (Payment Card Industry) DSS (Data Security Standard), is a set of information security requirements enforced by major credit cards: American Express, Visa, MasterCard, Discover. By following these standards your company reduces the risk of credit card exposure. The PCI Security Standard Council encourages all businesses that store payment account data to follow PCI DSS to lower financial risks. However, it is your responsibility to make sure that you are doing all that you can to ensure your customers’ payment card data is safe and that you’ve done everything to protect against breach. In the past, companies could maintain customer/patient credit card payment information on digital or source documents. Rules have changed however, regarding the storing of the source document, i.e., having all 12-16 digits of credit card revealed. Businesses are now required to reveal only the first six and last 4-digits of a customer’s credit card number on file. It is now the organization’s responsibility to update those files and redact the credit card number, or at a minimum – leave only the last four digits. Going green has been the “in thing” for some time now. Going paperless…well that’s the goal as well. Although for some firms it can be a challenge deciding the best way to go about it. Most organizations, along with creating their own internal documents electronically, receive documents and content from multiple sources and the struggle can be how to manage all those different source documents. Selecting a document and content management software solution can save your company time and money.